Your Search for the perfect compact video camera is now here! Project successfully funded on Kickstarter! Sign Up for a Chance to win IDOLCAM! Are you looking for the perfect compact video camera? Here are some of the issues you must consider before buying your next video camera. First, when choosing your compact video cameras, ask yourself if you will need to attach it to tripods, selfie sticks and other universal 1/4" screw mount gears often. If the answer is a yes, you will need to look closely as many compact video cameras don't have a standard 1/4" screw mount. You will need to buy a proprietary 1/4" mounting adapter before you can attach the camera to standard 1/4" gears. This will be an extra piece of equipment you will need to bring along and assemble every time you need to attach to a tripod. Second, one of the biggest deal breaker with most compact video cameras is the fact they lack an interchangeable lens system that limits the user with just one lens. However, most video creators will need more than one lens to capture different perspectives to be able to tell their story properly and keep viewers intrigue. You will need to consider this very hard, as this means you might have to buy another expensive DSLR camera later down the road if you need lens options. Third, ask yourself if you want to look your best in front of the camera every time. If the answer is yes, you will probably need some form shadowless fill lighting like a ring light, or a soft box. However, this will make your compact video camera setup much larger and more time to setup and break down. -the compact cameras are no longer compact and now you will have to setup and break down each time you use it. Fourth, if you are sharing your videos with anyone other than your friends and family like on YouTube and for business marketing, then you must capture your audio with a high quality microphone as today's viewers are very discerning when it comes to audio, they will simply click away if your audio is bad. Most today's compact video cameras have a very average to poor microphone built-in and to make things even worse, many do not have an external mic jack that allows you to attach a high quality microphone unless you buy another attachment. So, more things to buy, more thing to bring along and more to setup. to attach it to your compact camera. -more to setup and break down each time you use. Fifth, if you like to shoot your videos other than just at eye level, a 180 degree rotational monitor is probably a good idea, so you can frame all your shots easily especially if you need to shoot selfie videos of yourself talking. Many compact camera lacks a rotation monitor, so you need to ask yourself if this is an important feature for you, otherwise you will need to spend more money later on. -even more things to setup and break down. Sixth, stabilization is another huge deal breaker. Stabilized videos help viewers indulge in your story, otherwise they will feel distracted and less enjoyable to view, which means less engagement for your videos. Choose a camera that can capture cinematic video straight out of the camera, otherwise you will need to buy a gimbal/steadicam type device or spend hours post stabilizing for each video you shot. camera that is bulky and heavy. -more weight to lug around with. Seventh, You really need to ask yourself, are you looking for a compact video camera that requires you to spend 5 to 10 minutes to setup and break down each time you use the camera. Like having to attach a 1/4" screw mount adapter every time you need to use a tripod, attach an external mic adapter in order to use an external microphone, attach a clamp arm to the camera so you can attach lighting, attach more clamp arms so you can attach a rotational monitor, bring along a DSLR camera in case you need different lenses, run wires to connect the mic, lighting and monitor and charge batteries for lighting, monitor, gimbal, DSLR and compact camera and ending up carrying a large camera bag and spend thousands of dollar in order to capture high quality video? Or, are you really just looking for a camera that have all of the above features in a compact form and always one click away from capturing stunning looking videos? We know choosing the right compact video camera solution can very frustrating and currently there are no simple solutions. We have been through it all and we hope you don't have to go through them like we did. This is the exact reason that has propelled us to dedicate the past 3 years on researching and developing a new type of compact camera, IDOLCAM, to address many of the shortcomings of current compact video cameras. We have 8 years of prior experience in designing helicam, gimbals, and drones for the professional video industry. IDOLCAM will be the first compact video camera to feature magnetic interchangeable lens system that comes standard with both a fisheye lens and a wide angle lens, a magnetic interchangeable lighting system that come standard with a ring light, a high quality mic, 180 degree rotational touch screen, a 3 axis gimbal for movie steady video and a fashionable carry case. 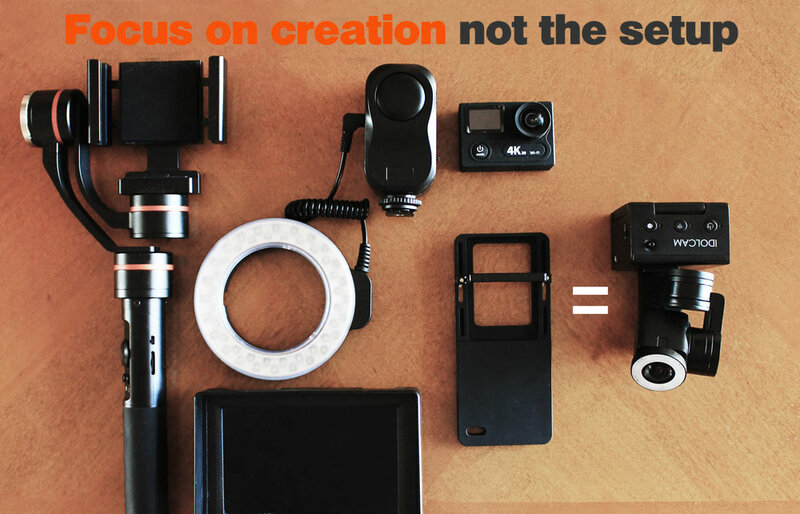 In other words, you can enjoy and focus on storytelling and worry less, carry less and spend less on video camera gears. We are a startup started with a couple of passionate video enthusiast just like you and with your support over the past year we are nearing production. Our philosophy is customers will always come first, not investors or shareholders. We strive to create the most value for our customers and we are constantly on the look out to add more values for IDOLCAM. We hope you can help share IDOLCAM with your friends and give IDOLCAM a try. Thank You! IDOLCAM Will Take Your Video-Taking Game to the Next Level. Versatility and flexibility of interchangeable lenses from fisheye lenses of action camera, to wide angle lenses of cinema camera to telephoto lenses to macro lenses and even large f1. 6 aperture lens for stunning low light and portrait shots, so you won't get stuck with one lens for your videos or have to buy additional cameras to achieve different looks. 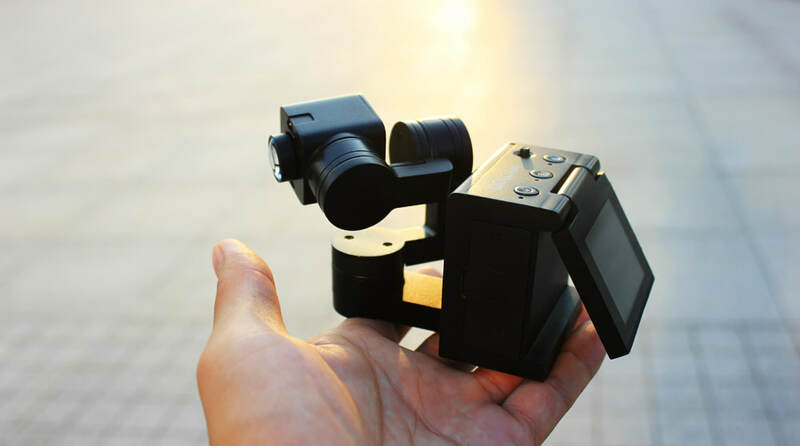 Three-axis gimbal harnessed from the latest drone technology help capture movie steady video. Lighting is the soul to every video, don't shoot in the dark. Small yet powerful with a wide range of accessory options for every situations and needs. IDOLCAM features SONY sensor with 4K video and 12MP photo, image quality and color that you can trust. Ambarella SOC advanced 4K image sensor pipeline (ISP) and a powerful ARM® Cortex™-A9 CPU and 28-nm process technology minimize power consumption while maximizing performance. Battery Life - Approx. 135 mins @ 1080p gimbal off, 85 mins with gimbal on. Let your voice be heard! Capture your vision with IDOLCAM! My name is Jason. I’m a gimbal and drone developer and a professional photographer. IDOLCAM started out as a drone project, but most of my friends are more interested in the mini gimbal, therefore we created IDOLCAM. IDOLCAM started on Kickstarter and now we've grown the team and are getting ready to ship our first units estimated late January. IDOLCAM has close to 500 upre-orders on Kickstarter and estimate to deliver in May to June of 2019. We have a limited release of 1,000 units with less than 200 units left as of now. 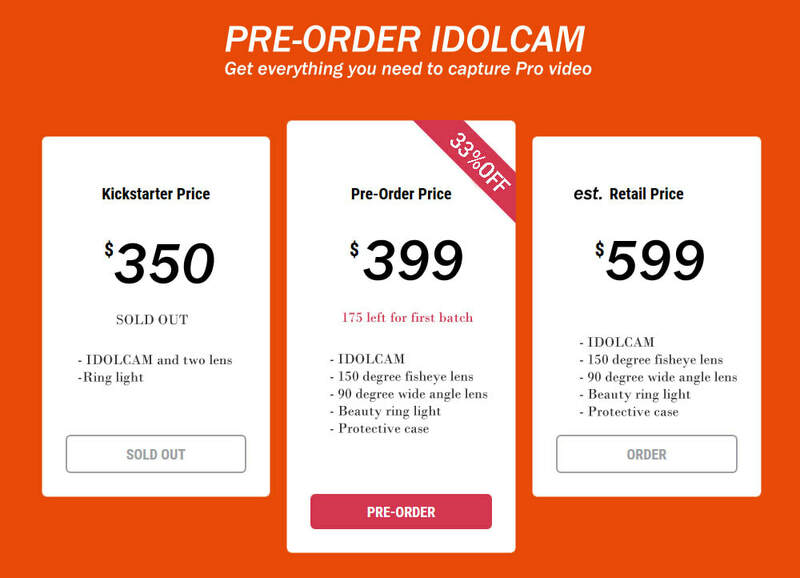 Pre-order to reserve your very own IDOLCAM now!!! Free $50 protection case, $45 fisheye lens, $30 beauty light for pre-orders. Pre-order you very own now!